Everett Hatch grows and harvests tomatoes, cucumbers, green peppers, squash, and turnips to give to food pantries. Retired Massachusetts State Police Trooper Mike Lapointe taps a foil pan and watches it spin on the string that attaches it to the pole in his hand. The low-tech device, he explains, was intended to keep crows away from tomatoes. It didn’t work. So Lapointe moved a crow carcass into the field from the nearby road where it was killed, and that did the job. “We hung that thing up until it was basically a skeleton and the crows didn’t come around,’’ Lapointe says. 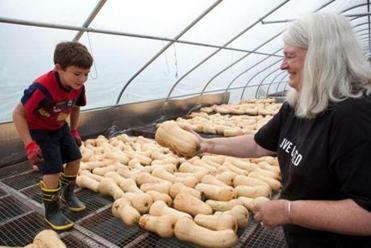 Jake Whitney helps Amy Clarke lay out squash for drying. “They came to my house [instead] and woke me up!’’ says Linda Martin, who lives less than half a mile up Plain Road in Greenfield from the plot where they’re taking out tomato stakes. Martin and Lapointe are the youngsters on the all-volunteer crew that helps retired strawberry farmer Everett Hatch get thousands of pounds of fresh produce to Franklin County food pantries. The others, like Hatch, are in their 70s and 80s. What makes Hatch unusual is that he is growing produce just to give it away. Franklin County ranks third in the state for poverty, according to 2009 census data, but it is rich in fertile soil and has plenty of farmland. 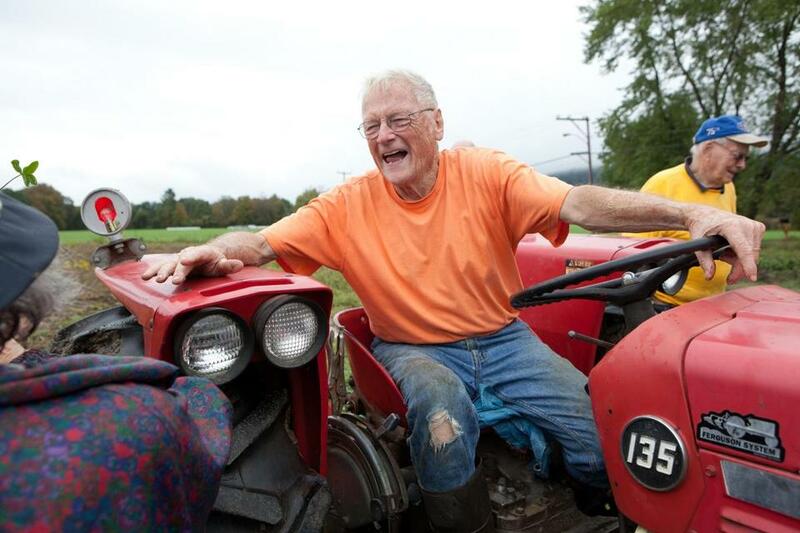 As a longtime volunteer at the Franklin Area Survival Center in neighboring Turners Falls, Hatch says he saw the vegetables distributed by the center’s food pantry. A recipe from Mary Siano of Center for Self-Reliance food pantry, this pistou, which contains potatoes, tomatoes, zucchini, and basil, can be made with ingredients right from the pantry. It’s especially nice served over crusty bread and sprinkled with Parmesan. Dino Schnelle, coordinator of the Center for Self Reliance food pantry in Greenfield, served on a hunger task force with Hatch. 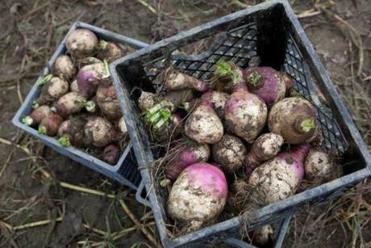 Freshly harvested turnips on Everett Hatch's farm. “He wanted to just plow up a half acre of land, plant produce on it and give it all away,’’ Schnelle says. And that’s exactly what Hatch has done. He grows tomatoes, cucumbers, green peppers, summer squash, and winter squash - foods that pack a lot of nutrition and are relatively easy to grow and harvest. Once the winter squash crop is in - with help from a group of Kiwanis Club volunteers - Hatch estimates he will have donated about 10,000 pounds of produce for the year. Amy Clarke, director of the Franklin County Community Meals Program, which operates a food pantry in Orange, says she receives fresh produce from other farmers and grocery stores. But Hatch is the only farmer she knows of who grows vegetables just so he can donate them. To Hatch, the project is a tangible, practical thing. He has the land and the skills and he’d rather be in the field than in a meeting. On this particular day, after the crew pulls up the tomato stakes and failed scarecrow devices and picks the last of the cucumbers and peppers, Hatch takes them on a little side trip to a field of sweet corn half a mile up the road. “The guy that owns the land just planted it,’’ Hatch says, “I don’t know what his original plan was.’’ The night before, the landowner had called Hatch and asked him to harvest it and donate it. It doesn’t take long for the crew to fill Hatch’s pickup truck with fresh Silver Queen cobs. Clarke says the area has a persistent need for food assistance. Flooding from Tropical Storm Irene brought new families to the pantries, but the ongoing recession has led many once well-paid workers to confront food scarcity and seek support. Schnelle says with growing needs and shrinking budgets, it can be hard to stay optimistic. Hatch’s efforts offer hope. Amy Mayer can be reached at amyhmayer@gmail.com.